…they are meant to sustain. 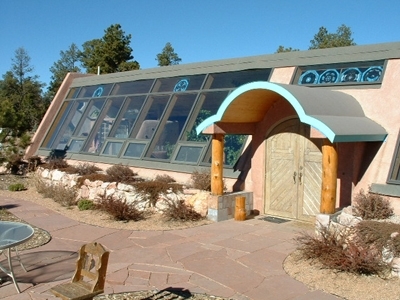 What is an earthship you might ask? It’s a fully functional house that is completely off the grid. It makes its own power, collects its own water, processes its own sewage, and can grow its own food. It’s made from recycled materials and can be built in any climate. While the idea may sound a bit odd, think about this: no electric bill, fewer emissions, low carbon footprint. I personally think that sounds amazing. And they look pretty cool too. They blend in with nature instead of tearing it down and dominating it. Don’t get me wrong, I’d love to have a nice house as much as the next person but these are nice houses, they can even be customized! A house that maintains its own heating and cooling? One that reuses materials that would otherwise be sitting in a junkyard? One that is aesthetically pleasing and economically friendly? They cost about the same as any other house on the market, except that they are built when and where you want them to be. Make a difference, own your own home, and live a healthier lifestyle. It’s all part of the new American Dream.